We’ve spoken to a lot of families, and almost all have agreed that one of the biggest points of contention in their household, is cleaning and chores. Nobody likes housework (or if they do, most don’t admit to it), and more often than not, one person gets saddled with cleaning almost every room in the house. In our opinion, this is simply not fair! Avoid this conflict by getting your whole family involved with cleaning the house using some of these tips and tricks. Everybody enjoys a little good-natured competition. Start encouraging your whole family to partake in housekeeping by assigning point values to different chores. At the end of the week, tally them up and crown the chore champion! You’d be surprised at how fast a person will run to the dishwasher when there are points involved. The only thing better than a championship title, is a prize to go with it. Reward your family for their good habits. Maybe your family members are eligible for a prize only after they’ve accumulated a certain number of points, or complete their chores for a consecutive number of days. There are other ways you can turn cleaning into a game aside from keeping store. Why not start a “family game show” with different challenges, like “who can vacuum the fastest” or “who can throw the most cans into the recycling bin”. No matter how many games or rewards you add, nobody enjoys cleaning for hours on end. Be sure to sprinkle break times throughout your cleaning sessions so that nobody gets frustrated or tries to flee the cleaning party. These breaks can also be a great time to visit and bond as a family. For an added bonus, prepare special snacks that are only available on cleaning days. 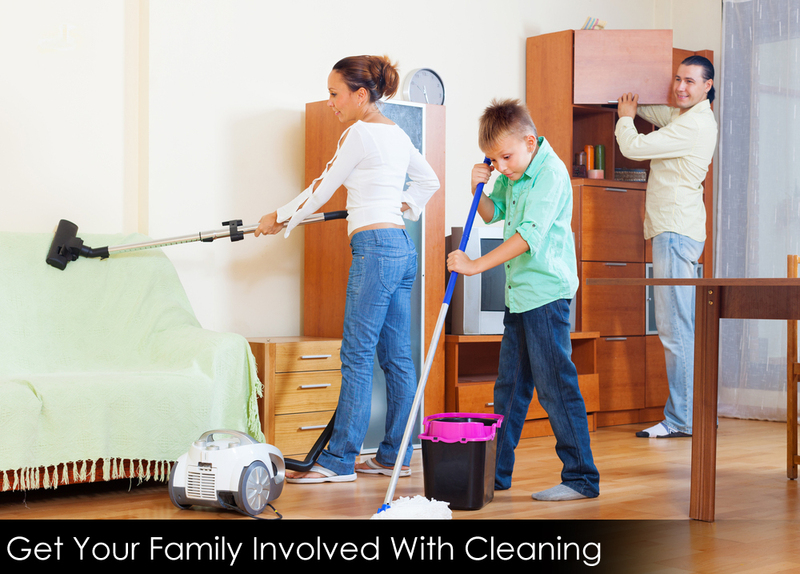 Instead of trying to corral your family into cleaning mode while they’re busy doing other things, schedule a certain time every few days or every week that the whole family will spend cleaning together. This way everybody knows it’s coming, and nobody can make excuses. Even better, if you use some of the tips above to make cleaning a fun activity, your family will actually be looking forward to these blocked off time slots. We can promise you that cleaning in your household will never be the same again!